The company did not shift its focus from chemicals to genetically engineered seeds overnight. In fact, it was another 12 years before it commercialized the first genetically engineered product, recombinant bovine growth hormone (rbGH), a controversial hormone used to make dairy cows produce more milk. And it was not until 1996 that it first brought genetically engineered seeds, Roundup Ready soybeans, onto the market. By 2000, the company had undergone such a sea change from its founding a century before that it claims it is almost a different company. In Monsanto’s telling of its own history, it emphasizes a split between the “original” Monsanto Company and the Monsanto Company of today. In 2000, the Monsanto Company entered a merger and changed its name to Pharmacia. The newly formed Pharmacia then spun off its agricultural division as an independent company named Monsanto Company. But, she adds, “even taking that at face value, that they are an agriculture company now, they are still producing seeds that are made to be used with chemicals they produce.” For example, Roundup herbicide alone made up more than a quarter of their sales in 2011. The proportion of their business devoted to chemicals is by no means insignificant. Monsanto’s pesticide product line includes a number of chemicals named as Bad Actors by Pesticide Action Network. They include Alachlor (a carcinogen, water contaminant, developmental/reproductive toxin, and a suspected endocrine disruptor), Acetochlor (a carcinogen and suspected endocrine disruptor), Atrazine (a carcinogen and suspected endocrine disruptor), Clopyralid (high acute toxicity), Dicamba (developmental/reproductive toxin), and Thiodicarb (a carcinogen and cholinesterase inhibitor). Defenders of Monsanto might reply to the charge that Roundup is no Agent Orange. In fact, the herbicide is viewed as so benign and yet effective that its inventor, John E. Franz, won the National Medal of Technology. Glyphosate, the active ingredient in Roundup, kills everything green and growing, but according to Monsanto, it only affects a metabolic pathway in plants, so it does not harm animals. It’s also said to break down quickly in the soil, leaving few traces on the environment after its done its job. Lovera is referring to “Roundup-resistant weeds,” weeds that have evolved in the past decade and a half to survive being sprayed by Roundup. Nearly all soybeans grown in the United States is Monsanto’s genetically engineered Roundup Ready variety, as are 80 percent of cotton and 73 percent of corn. Farmers spray entire fields with Roundup, killing only the weeds while the Roundup Ready crops survive. With such heavy use of Roundup on America’s farmfields, any weed – maybe one in a million – with an ability to survive in that environment would survive and pass on its genes in its seeds. By 1998, just two years after the introduction of Roundup Ready soybeans, scientists documented the first Roundup-resistant weed. A second was found in 2000, and three more popped up in 2004. To date, there are 24 different weedsthat have evolved resistance to Roundup worldwide. And once they invade a farmer’s field, it doesn’t matter if his crops are Roundup-resistant, because Roundup won’t work anymore. Either the weeds get to stay, or the farmer needs to find a new chemical, pull the weeds by hand, or find some other way to deal with the problem. “We’ve wasted Roundup by overusing it,” says Lovera. She and other food activists worry about the harsher chemicals that farmers are switching to, and the genetically engineered crops companies like Monsanto are developing to use with them. Currently, there are genetically engineered crops waiting for government approval that are made to tolerate the herbicides 2,4-D, Dicamba and Isoxaflutole. (These are not all from Monsanto – some are from their competitors.) None of these chemicals are as “benign” as Roundup. Isoxaflutole is, in fact, a carcinogen. Let’s spray that on our food! No discussion of Monsanto is complete without a mention of the immense amount of control it exerts on the seed industry. 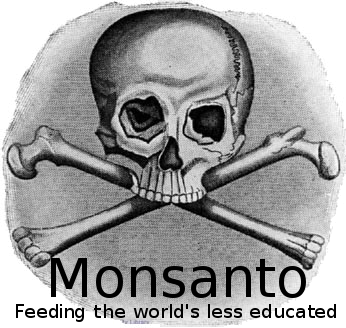 Monsanto began buying seed companies as far back as 1982. (One can see an infographic of seed industry consolidation here.) Some of Monsanto’s most significant purchases were Asgrow (soybeans), Delta and Pine Land (cotton), DeKalb (corn), and Seminis (vegetables). One that deserves special mention is their purchase of Holden’s Foundation Seeds in 1997. George Naylor, an Iowa farmer who grows corn and soybeans, calls Holden’s “The independent source of germplasm for corn.” Small seed companies could buy inbred lines from Holden’s to cross them and produce their own hybrids. Large seed companies like Pioneer did their own breeding, but small operations relied on Holden’s or Iowa State University. But Iowa State got out of the game and Monsanto bought Holden’s. Monsanto’s tactics for squashing its competition are perhaps unrivaled. They use their power to get seed dealers to not to stock many of their competitors products, for example. When licensing their patented genetically engineered traits to seed companies, they restrict the seed companies’ ability to combine Monsanto’s traits with those of their competitors. And, famously, farmers who plant Monsanto’s patented seeds sign contracts prohibiting them from saving and replanting their seeds. Yet, to date, U.S. antitrust laws have not clamped down on these practices. With the concentrated control of the seed industry, farmers already complain of lack of options. For example, Naylor says he’s had a hard time finding non-genetically engineered soybean seeds. Most corn seeds are now pre-treated with pesticides, so farmers wishing to find untreated seeds will have a tough time finding any. Once a company or a handful of companies control an entire market, then they can choose what to sell and at what price to sell it. Furthermore, if our crops are too genetically homogenous, then they are vulnerable to a single disease or pest that can wipe them out. When farmers grow genetically diverse crops, then there is a greater chance that one variety or another will have resistance to new diseases. In that way, growing genetically diverse crops is like having insurance, or like diversifying your risk within your stock portfolio. She also calls Monsanto “the poster child for the need for antitrust enforcement” – something that the Justice Department has yet to successfully deliver up. In fact, last November the government ended a three-year antitrust investigation of Monsanto. A third recommendation Lovera hopes becomes a reality is mandatory labeling of genetically engineered foods. “If we had that label and we put that information in consumers’ hands, they could do more to avoid this company in their day-to-day lives,” she says. In the meantime, all consumers can do to avoid genetically engineered foods is to buy organic for the handful of crops that are genetically engineered: corn, soybeans, canola, cotton, papaya, sugar beets, and alfalfa.